The last few weeks have been very enjoyable from an iaido point of view. Twice a week I am trekking up the hill to the University to join in with their early morning sessions. This has given me the chance to experience teaching for the first time, and I am eternally grateful for the opportunity. I feel a little awkward because I do not feel in the slightest bit qualified to be telling anyone else how to do iaido, yet it is gratifying to be able to convey my modest knowledge of the basics to beginners. Even though I'm sure my technique looks appalling, my hope is that at least I might put them on the right path. From my perspective, having to explain techniques is forcing me to examine my own understanding in greater detail, and this in turn has proven extremely beneficial in exposing weaknesses to be corrected. 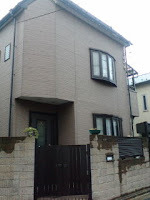 Well, the househunting is finally over, and the missus is shortly to become the proud owner of a nice house on the Western side of Tokyo. I was initially pretty worried by the seeming lack of information, but I think it's turned out ok in the end. The place seems quite large (by Japanese standards) and the area sounds quite fun - not far from Kichijoji and Inokashira Park. So our life's about to enter a new phase. I'm excited but apprehensive at the same time. But inside I feel it's the right move - if only to avoid having to watch this country implode as the economy collapses. The house-hunting in Japan appears to be nearing its conclusion, for better or worse. Communications with the missus have been extremely tense. She's obviously feeling the strain of making probably the biggest decision of her life, but in the process it has thrown the innermost workings of her mind in stark relief. I once attended a management training course - total waste of time, of course. But one thing I do remember was the guy telling us a story about a fire in the engine room of a merchant ship at sea. Virtually every nationality under the sun was represented in the crew, and although they could all speak English, as the fire took hold and the panic set in, they all reverted to screaming instructions at each other in their native tongues. The phrase was, "the language of panic is your own." Very true. Under pressure, most people will revert to type and it is under these circumstances that the true character is revealed. For my part, well I can't really comment objectively. In the past, when I've had difficult times at work I've just told the boss to stick it and walked out. But not always, and if I'm really committed to something I will always see it through to the end. For the missus, I think deep down she cannot trust anyone. When she's under pressure, she is extremely sensitive - bordering on paranoid - to any sign that she is going to be ripped off or let down. She can be vicious in her condemnations, and is nearly impossible to deal with. Such was the case this week. I am blogging from the pub through the wonders of 3G. Today is the last Sunday before the girls are back, so i intend to take full advantage. This morning i spent doing iaido. Thankfully a bit better than last week. But still a lot of work to do to get my Omori sorted out. I also took the opportunity to practice kendo kata as I'm supposed to be teaching it this week. Hmm - should be interesting. Sunday lunch at the Phoenix is obviously the place to be for the local OAPs. The place is packed with crumblies enjoying a Sunday roast. This pub is so far out of step with the modern world - like stepping back in time 25 years -but all the better for it. With its horsebrasses and fake Tudor beams, it reminds me so much of the social club at the place where I did my engineering training. And in a funny way, it always makes me a little bit sad - remembering the wonderful times I had there, and the "family" of colleagues I grew up with. I still dream about being back there sometimes, even after all this time. Strange. Yesterday was an important milestone in my martial arts career. For the first time, I was invited to teach a class. It was a scary, but immensely gratifying experience. I don't consider myself to be particularly knowledgable or skillful, so I was flattered that the dojo leader thought I was worthy of sharing what little knowledge I have. Hopefully I didn't display my ignorance or steer those students too much in a wrong direction. I have the opportunity next week to join two more classes, so I look forward to leading another couple of sessions. The satisfaction I feel is not really related to my personal ego, but rather to the honour and joy that comes from sharing the skills and traditions of my school. It's so much a part of my life now I think think of Eishin ryu iaido not as something that I do, but as something that I am. If I can convey a little of that feeling - even through my clumsy unrefined technique - I'd be happy. As readers will have noticed, I've got quite into political blogging over the last few months. Like the many others doing the same, it's about the only way that I feel my voice can be heard in this country after Labour's destruction of democracy. Plus the fact, it's fun to vent the full fury of one's frustration. But as I find I'm getting more and more involved in political comment, the less appropriate this particular blog seems to be as the forum for that discussion. So, I have decided to move the political argument onto another blog - one that allows me to really speak my mind.